Okay, so I was really hoping that I would finish my One Zentangle a Day self-imposed challenge in 2013. Alas, this was not meant to be. Life always prove that we may not always accomphlish our life’s ambitions, but that does not mean that we stop trying. I learned it is best to brush of the dust of dissapointment and carry on with renewed enthusiam. So here we are on the fourth day of January 2014 and I am ready to continue my little challenge. Trust me, I was really tempted to throw in the towel and stop blogging about this challenge completely. But what would that prove? 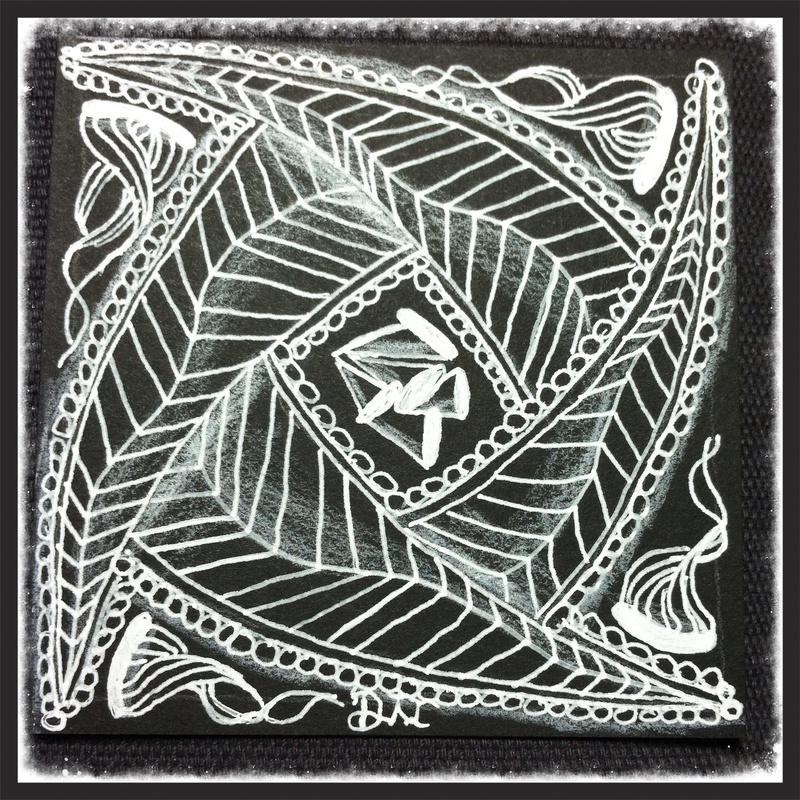 You may have noticed that I returned to using a black art tile with white ink. This choice was not a morbid reflection of the new year nor is it reflecting my feelings of my recent losses. The choice of using a black tile it is because that it is simple and elegant which shows my three newly learned tangles beautifully. In exploring these tangles in my art journal, I learned to love herring bone look of “Meer” and loved challenging myself to combine Meer with the Japanese style tangle of “Enyshou” and the triangular style of “Reef”. All in all, I really like my first art tile of the new year and look forward to continuing and finishing my One Zentangle a Day challenge. Next Post Snowbound! Project: Redecorate our Mantle to the rescue!